The following is the first in a series of postings in which our institute members ask themselves “What does transnational and global history mean for my own research?”. Our first posting is by Kelsey Jackson Williams, now a British Academy Postdoctoral Fellow based at St Andrews. Why transnational history? My background is in the intellectual history of early modern Britain and as I write this I’ve recently begun a new book project which focuses on antiquaries in Enlightenment Scotland. On the face of it, that doesn’t sound very transnational at all. To make things worse my graduate degrees are in English Literature, a discipline which by its very nature tends more often than not to rigorously reaffirm the existence of linguistic and national boundaries. So why transnational history? Because anything else would be a tremendous distortion of the people and issues I study. The antiquaries I’m currently investigating were not living isolated in Scotland – quite the reverse. From their vantage point on the north-eastern coast they were entangled in sea routes which stretched to France, the Low Countries, Denmark, Sweden, the Baltic coast of the German lands, and as far as Reval or Ingermanland at one extreme or Italy and the Levant at the other. Positioned as they were, they found themselves participating in an intellectual culture which does not map onto national borders, then or now. Even something as basic as their university education challenges the assumption, so often made, that early modern Scotland was insular, peripheral, or otherwise cut off from the rest of the world: Robert Sibbald (1641-1722) studied in Leiden, George Mackenzie (1669-1725) in Oxford, another George Mackenzie (1638-1691) in Bourges, John Paul Jameson (1659-1700) in Rome, Thomas Innes (1662-1744) in Paris, Patrick Abercromby (c.1671-post 1735) in Douai. The list goes on. And as for what they read? Sibbald is a good example because we have a relatively complete catalogue of his library. Randomly sampling it I see books published in Würzburg, Raków, Rotterdam, Paris, Messina, Geneva, Treviso, etc. In this light, thinking transnationally seems like the sensible thing to do. I’m still figuring out how to go about this – transcending nationalist assumptions is easier said than done. What I have learned, though, is that looking past the preconceptions of older literature (say, Scots were backward, isolated, and only cared about Scotland) can reveal remarkable, untapped riches (say, a 25,000 volume library, now in Bavaria, which was assembled by a community of Scottish scholar-monks at Ratisbon throughout the early modern period). I’ve also become increasingly convinced that maps are incredibly powerful hermeneutic tools. 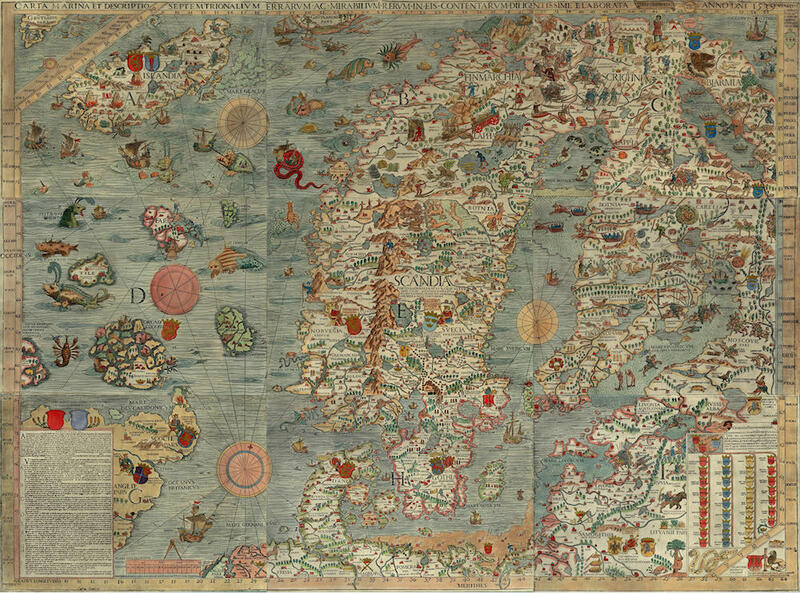 Like the beautiful 1539 carta marina drawn by the Swedish scholar Olaus Magnus (printed, however, in Venice) and pictured here, all it takes is a different envisioning of space to make you think, “hold on – what if the relations between x and y were actually this?” Thinking about space and how the real and imagined spatial contours of the early modern world affected scholars continues to be vital to my research. So for me, the answer to the question of “why transnational history?” or “why spatial history?” is quite simply: it opens new avenues of research, it makes me think about my subject in new ways, and it makes me reach beyond older nationalist assumptions to begin to recover the rich, strange, and thoroughly transnational world of early modern scholarship. Reval being the German for the city we now know by its Estonian name of Tallinn. Ingermanland (in Swedish) at the far eastern end of the Baltic was Ingeri to the Estonians, Inkeri to the Finns, or Ингрия to the Russians. The Ingrian noble family Pistohlkors believed they were descended from a younger son of the Scotts of Craighall (an easy drive from Dundee). Ratisbon being the English and Scots name (at least until recently). It’s Regensburg in German, Ratisbonne in French. Image, Carta Marina, public domain on WikiCommons. This entry was posted in Uncategorized by Konrad Lawson. Bookmark the permalink.